"ROADSTER" TURN SIGNALS GET IN THE WAY , "ROADSTER" REQUIRES EFFORT. DOES NOT FIT 1990 - 2003 SPORTSTERS. WE TRY HARD TO MATCH or BEAT CHINA PRICES pleasemail (milelers at fastmail dot fm) BEST DEALS. 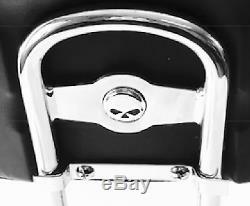 CHROME DETACHABLE SPORTSTER BACKREST FOR YEARS 2004 - 2018. DOCKING HARDWARE IS NOT INCLUDED please look at other items if you need DOCKING. EVERYTHING YOU SEE IN PHOTO. TALL CHROME UPRIGHT " ROUND BAR " WITH/. 53913-04 CHROME DETACHABLE SIDE PLATES. 98 LARGER SMOOTH BUCKET PASSENGER PAD WITH CHROME BRACKET. WHAT IS MISSING YOU MAY NEED >. 53529-04 DOCKING HARDWARE KIT (PLEASE SEE OTHER ITEMS). 52710-07 H D DETACHABLES SIDE PLATES. 52300096 H D ADJUSTABLE SIDEPLATES. 51851-09 LOW MEDALLION STYLE SISSY BAR UPRIGHT. 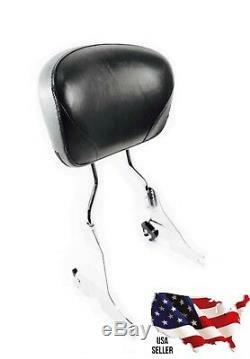 52626-04 SMOOTH TOP STITCHED MEDIUM LOW BACKREST PAD. 53529-04 H D DETACHABLES DOCKING HARDWARE. The item "HARLEY DAVIDSON TALL LARGE PAD CHROME DETACHABLE BACK REST SISSYBAR SPORTSTER" is in sale since Thursday, February 15, 2018. This item is in the category "eBay Motors\Parts & Accessories\Motorcycle Parts\Seats & Seat Parts\Backrests & Sissy Bars". The seller is "boshemiran" and is located in Maumee, Ohio. This item can be shipped worldwide.